It’s been a good month full of cookies, cakes, pies, and candy. Somewhere in all of it I made this soup. I think it was on the day I made chocolate chip cookies, peanut butter cookies, and two batches of shortbread cookies. I am a baking machine. When I get going, it is on. In between cookies baking I thought about a filling soup to balance out the sugar. Yes, it has cream in it, but just a bit. I got some beautiful kale and sweet potatoes at the farmers market which really made this soup hearty. You’d think the chicken sausage would do that, but nope, it was the vegetables. 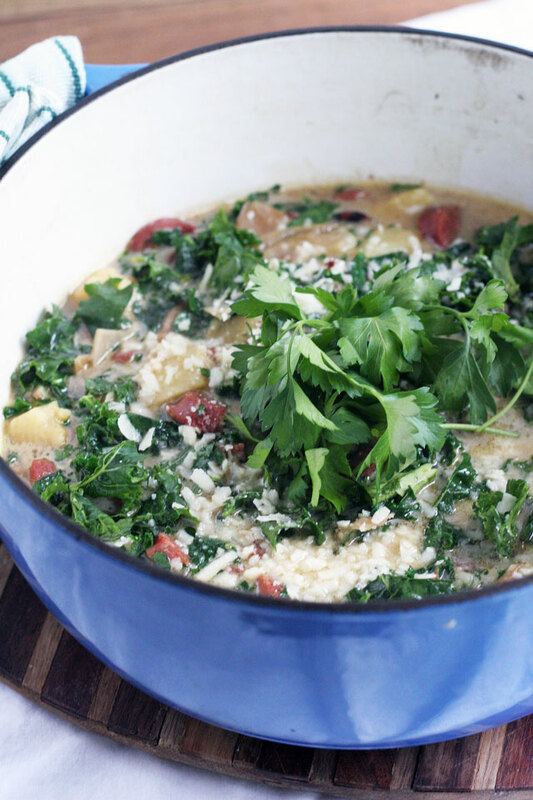 This is a quick and easy soup to make for all to enjoy. I’d serve it with good crunchy bread, because we need more carbs. ENJOY! This is the perfect pot of food to bring in the new year, it’s not fancy but its fill your belly happy food. Tip to better kale: After I de stem and chop the kale, I place in my salad spinner to clean. After clean, I massage the kale for 1 minute directly in the spinner. It makes for better greens. You can do this with any thick hearty green. 1. In a large pot or dutch oven, place 1 tablespoon olive oil over medium heat, add sliced onions. Cook for 10 minutes, stir occasionally, a touch of color is ok. Raise the heat to medium high, add more olive oil, add the sausage to brown. Cook 2 minutes stirring occasionally. 2. Deglaze the pan by adding the balsamic vinegar, and scrape the brown bits off the bottom of the pot with a wooden spoon. Add stock to assist in the scraping if needed. Add the rest of the stock. Add 1 teaspoon salt, 1/2 teaspoon pepper, and chili flakes. Stir. Bring to a boil, reduce to a simmer. 3. Lower the heat to medium low, add the sweet potatoes and cook until tender, about 20 minutes. Taste for seasoning, I added a pinch of salt and pepper here. Turn off heat, add cream, stir then add kale. Stir to combine. Serve with parsley and parm reg cheese. 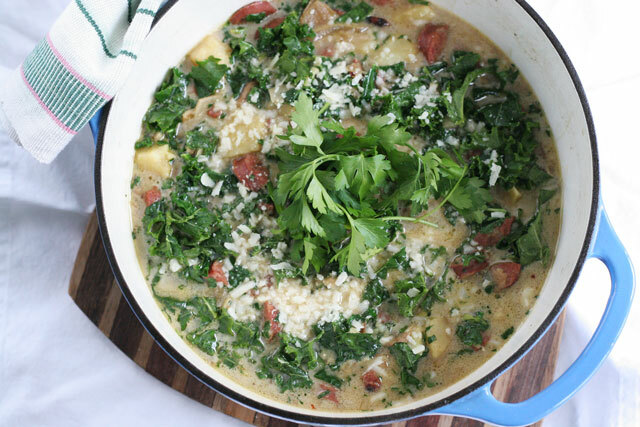 I love the ingredients- so hearty and comforting for how cold it’s been here. I swear I could live off soups all winter long! Thanks for some new inspiration- definitely making this soon! Thank you, Kelley! I am with you all the way. I’ve made this soup a few times now, split pea today, and pho tomorrow. It is so easy to get vegetables, protein and fill up. I made a chipotle tomato soup with quinoa last year, the quinoa makes it irresistibly. But I will for sure add the feta next time, good call on that.